This lemon pickle is the first successful pickle that I learnt to make. The recipe is simple. 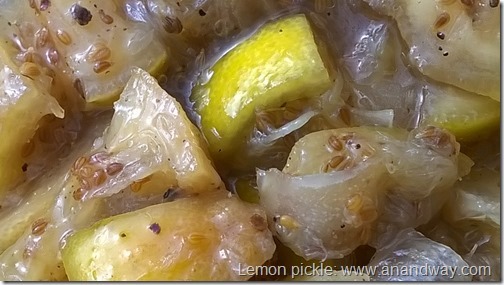 Come to think of it, old lemon pickle is Ayurvedic medicine and food at the same time! Delicious medical care. Ayurveda says that if your food is medicine, you will not need medicine. Truly, correct food, eaten with respect, is better than the best medicine for the body. For this lemon pickle, I take the following ingredients, shake them up in a glass bottle, and let the bottle stand in sunshine for a few days, shaking it once daily. Then it goes to the kitchen, where its contents quickly disappear with parathas, puri, roti and rice.